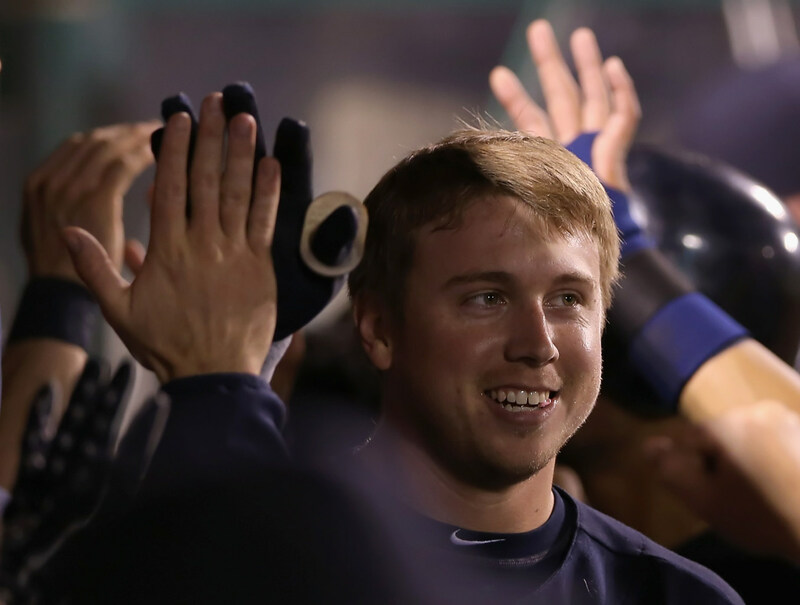 Who are you and what did you do with Justin Smoak? Tonight's Mariners game featured a team continuing to evaluate talent while getting seriously confused in the process. The other team is fighting for a playoff spot, but that's not as important as what Justin Smoak has done so far this month. Not because he's changed everybody's mind with a grand total of 58 at bats, but what he's done in those 58 at bats have been so far from what we've come to expect from him. From the very first game of the season until August 31st, Smoak impressed absolutely no one. His batting average sat below the Mendoza Line at an unsightly .190 after 395 at bats. He was still hitting for decent power with 14 home runs in that time, but that was about it. He was walking at an 8.3% clip in 434 plate appearances, which is the opposite of great, but not to the extreme of Miguel Olivo. Miguel Olivo, by the way, has more home runs on the season than he does walks with 12 homers and 7 walks. Getting back to Smoak, he wasn't walking a whole lot in that time, but on the flip side, he wasn't swinging wildly every time up either, with a K rate of 22.6%. That's nearly a quarter of his plate appearances, but in the current era of offense we're in, that's right around average. This also hasn't been strictly a home/road thing either, which is the case with more than a few Mariners players. I realize there may be a few numbers missing, but the ones above get the point across rather well. As you can see, his average is only slightly improved when away from Safeco Field. The park has been a black hole all season long, and to an extreme degree, even when compared to previous years. It's beginning to normalize, but there are multiple factors at play that can skew the numbers, such as quality of opponent, hot streaks, cold streaks, etc, not to mention all of the weather variables. Over his career, Smoak's best month has been September. After looking at his career splits and seeing that, I just about fell out of my chair. Not because of the numbers, but there was a spider, all up in my grill. Spiders are cool and everything, but not up close and personal. Getting back to the point, even last year in September, there was hope that he had gotten over his thumb injury and it was starting to come together for him. What he's done so far this year came as a shock not because he's having such a good month, but because of what he'd done the previous 5 months. It's like trying to drive a drag car through an obstacle course and then hitting the straightaway. He's having one hell of a stretch for a guy struggling to keep his average above the .200 mark. The lesson, which I dislike pointing out, is that we're talking 58 at bats in a month that's not even over yet and has been historically his best month. I'm not holding out hope that this is where he's figured things out. I AM holding out hope that maybe, just maybe, he could become a decent major league regular. If not for the Seattle Mariners, then whatever team will have him. In my mind, this game was over before it started. Zack Greinke lately has been pitching the way he was expected to pitch when he came over from the Brewers. He had a 1.48 ERA in 4 starts so far in September with a WHIP of 0.79. Ironically, his SO/9 of 6.5 has actually been his worst month for that particular stat, though it's not like you have to have a rate of 9+ to have that ERA and WHIP in 4 starts. The only reason I mention his strikeout rate is because in tonight's game, he tossed 5 innings of one run ball with 13 strikeouts. Thirteen strikeouts. You know how ridiculous that is? Out of 15 outs recorded while he was on the mound, 13 came via the punchout. As a team, the Mariners equaled their futility of April 29, 1986 when Roger Clemens struck out 20 Mariners. The only other time the Mariners struck out 20 or more times in a game? September 25, 2012. If I did the search right, and I admit I'm a rookie when it comes to the Baseball Reference Play Index, there have been 41 other instances since 1918 of a team striking out 20 or more times in a game. If you choose to dwell on that bit of information, I would suggest moving on, quickly. Erasmo Ramirez didn't get into trouble so much as he was put into trouble thanks to a Kyle Seager error in the bottom of the first. The error wasn't a bad bounce or anything like that, but more the fact that Mike Trout is wicked fast and why is he on the Angels? I love seeing the guy play given what he's doing, but man..... After the error, a couple of singles gave the Angels their first run and a sacrifice fly later in the inning gave the Angels a 2-0 lead. With the way Greinke had been dealing so far and it was Justin Smoak, you can't really blame him for throwing him a challenge fastball that Smoak didn't miss. He almost did, as the home run had to be reviewed to make sure it actually went over the wall and didn't hit the top of it. The Angels played add on through the sixth to make it 5-1, which is where the Angels' scoring ended. For their part, Seattle made a good run to make it a ballgame in the last several innings, but couldn't quite get there. In the top of the seventh, back to back doubles by Dustin Ackley and Franklin Gutierrez made it a 5-2 game. Seager and John Jaso couldn't drive Guti in from second, but Smoak took up the slack and drilled a pitch down in the zone into the bullpen out in left field. That made it a 5-4 game through 6 1/2 and there the score remained until the last out was recorded. The Mariners combined for 11 hits in the game with 7 going for extra base hits. Ackley had a double, Guti checked in with a pair of doubles, as did Olivo, and Smoak added two home runs to his total for September. All in all, it was a brutal game to watch that, while close, never really felt that way at all. It'll be the Mariners and Angels again on Wednesday evening at 7:05 Pacific with C.J. Wilson going up against Felix Hernandez on the bump.